After creating immense hype with a myriad of leaks and teasers, Xiaomi has today finally taken the wraps off its first-ever flagship smartphone for 2018 – the Mi Mix 2S. 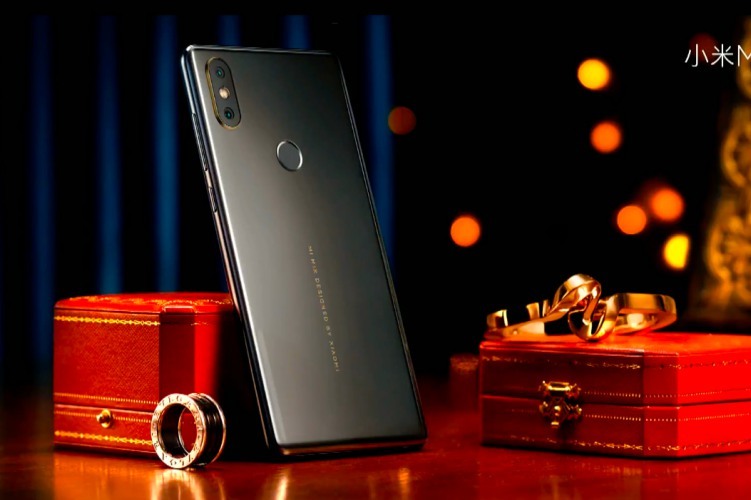 The device was launched at an exclusive event organized in Shanghai and has been priced at 3,299 CNY (approx Rs 34,000). There’s no way we can get by the Mi Mix 2S launch without talking about the design since this has been the primary focus of Xiaomi since the inception of the lineup. The Mi Mix 2S features the same edge-to-edge design of its predecessor, the Mi Mix, with the bare minimum side and top bezels but a huge bottom chin. While there were previously rumors that Xiaomi was looking to ditch the bottom bezel and move the front camera to the top left corner – via a notch – but that isn’t the case here. It seems Mi Mix 2S is just an upgrade to its predecessor, with the latest hardware, and the new design should be incoming with the Mi Mix 3 – hopefully later this year. As for the materials, Xiaomi has diverted its attention away from ceramic and is now using 7000-series aluminium to build the Mi Mix 2S from scratch. However, you won’t notice any difference in the construction as the Chinese giant has coated the device in a ceramic coat – both in black and white – and it’s still soft and shiny. You also get 18 karat Gold highlights on the Mi Mix 2S, as expected. Coming down to the nitty gritties, the Mi Mix 2S features a beautiful 6.01-inch FullHD FullView (18:9 aspect ratio) screen. The earpiece is still sitting in the smaller top bezel, whereas most of the sensors are tucked behind the display. There’s almost negligible bezel on the sides and the bottom bezel has been shrunk by x% as compared to the Mi Mix 2. It still holds the front selfie camera at the bottom right corner. 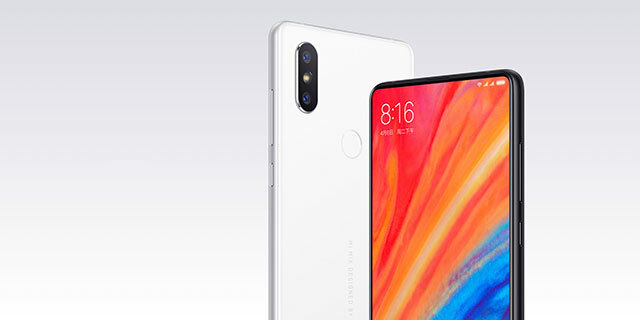 Mi Mix 2S is the first Xiaomi device to feature the latest Qualcomm Snapdragon 845 chipset, which was announced way back during the launch of the mobile platform itself. This has been coupled with Adreno 630 GPU and Qualcomm’s onboard AI chip is helping Mi Mix 2S scan 3x images/second as compared to iPhone X. You also get 6GB/ 8GB of RAM and 64GB/ 128GB/ 256GB of internal storage. In the software department, the Mi Mix 2S is powered by Xiaomi’s MIUI 9 ROM that has been built on Android 8.1 Oreo. While all get all the goodness of Android Oreo, Xiaomi is improving the user experience with the addition of navigation gestures and the trendy new Face Unlock feature. 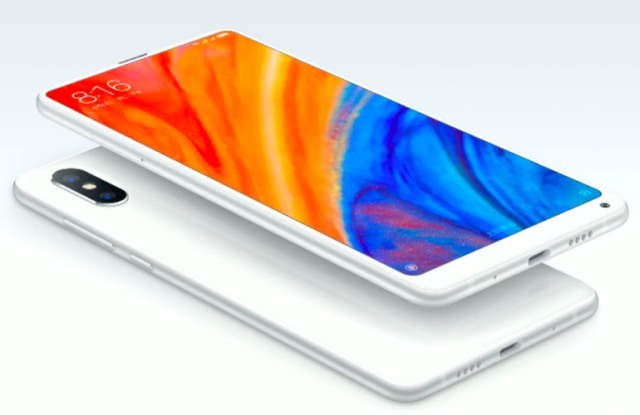 However, the highlight of the software will have to be Xiaomi’s Xiao AI virtual assistant, which is extremely capable and can answer all of your queries, wake the screen and listen to your commands, navigate through the phone’s apps, control your smart home and more. 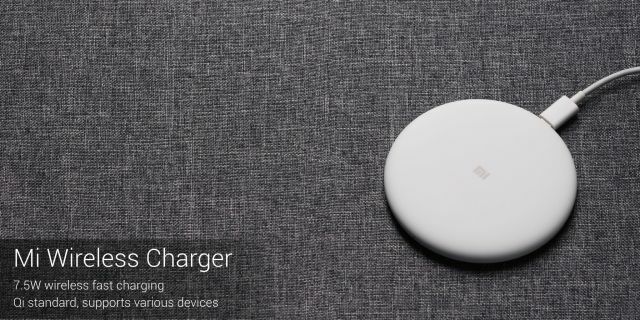 This device features a decent 3,400 mAh battery, but you don’t have to worry much as it also supports Qualcomm Quick Charge 4.0 technology via USB Type-C and Qi wireless charging. Yes, Mi Mix 2S is also the first Xiaomi device to feature wireless charging and NFC as well. This is the biggest change you’d notice in the Mi Mix 2S. Xiaomi never got the cameras quite right on the former Mi Mix devices, since they were treated like prototypes for their future smartphones. however, Mi Mix 2S is now their flagship smartphone and has been packed with an iPhone X-style vertical dual camera. It is quite resemblant to the camera setup we’ve already seen on the Redmi Note 5 Pro (a la Redmi Note 5 in China). As the rumor mill had suggested, the Mi Mix 2S sports a vertical dual-camera setup, including a 12MP wide-angle + 12MP telephoto lens. This is the same setup as the iPhone X and uses the Sony IMX363 sensor, which is utilized in all major flagships. We’ve also got a massive 1.4-micron pixel, dual-pixel autofocus (helps better low-light photos), and 4-axis OIS (Optical Image Stabilisation) in one of the lenses. This is coupled with features such as portrait mode, optical zoom and hardware-level multi-frame noise reduction mechanism. This means the phone is no longer using just the software enhancements to reduce noise, but a hardware-level tech that’s been developed in-house. 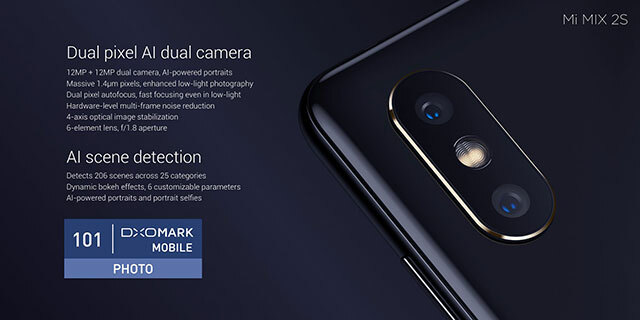 The company has also baked in AI capabilities into its camera, which has significantly improved the quality of bokeh mode photos on the Mi Mix 2S. The AI has now enabled dynamic bokeh on the device, meaning you can adjust it after clicking the picture. But, you’re no longer simply adjusting its intensity but also how it will look – change the shape of background lights to hearts, getting DSLR-like bokeh, and move them around to create swirl light effects. In addition, the AI smarts of the camera are also capable of scene recognition. This means the camera can recognize objects, settings around our surrounding to adjust the contrast and brightness according to it. It can also give instant language translations and currency conversions as well. And if DxOMark scores interest you, the Mi Mix 2S scores a whopping 101 for its camera performance. Since Xiaomi is now providing you with more power and a dual-camera setup, the Mi Mix 2S has been priced accordingly. The 6GB+64GB variant will cost you 3,299 yuan (approx ₹33,700), 6GB+128GB will cost you 3,599 yuan (approx ₹37,000) while the highest-end 8GB+256GB variant will sell for 3,999 yuan (approx ₹41,000). So, does the Mi Mix 2S look good to you? Let us know in the comments below. Xiaomi also launched a brand new Mi Gaming Laptop for the Chinese market, which up to features a Nvidia GTX 1060 GPU for graphics power, with all-metal build, RGB lighting, dedicated macro keys (including one to order fast food) and very reasonable pricing. In addition, the company has launched the Mi AI Speaker Mini, which has also gone on sale in China. In addition to smart speaker features, it can also be used as a smart home hub, if you are using enough Xiaomi devices.